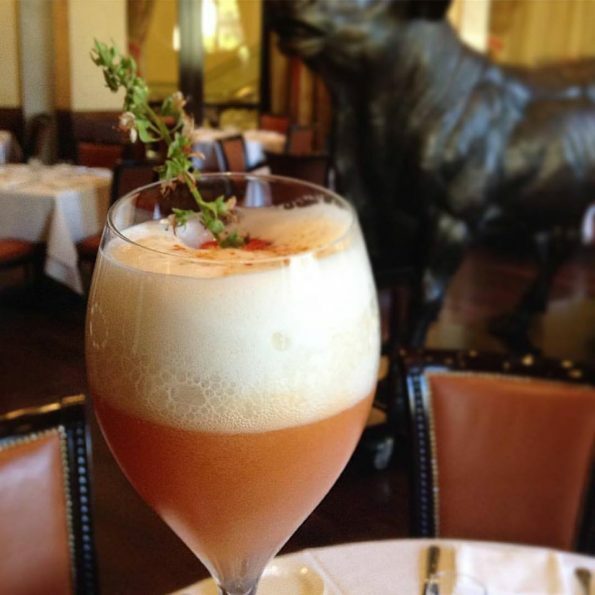 This summer, Carnevino Italian Steakhouse at The Palazzo Las Vegas invites adventurous imbibers with a taste for the unexpected to indulge in its latest farmer’s market cocktail, Vesuvius. Always favorites with Carnevino’s patrons, farmer’s market cocktails change with the seasons to make the most of locally sourced, freshest and most flavorful ingredients. Named for the infamous volcano near Naples, Vesuvius combines freshly squeezed lemon, blood orange and pineapple juices with Fortaleza Blanco tequila and tangy Aperol. House-made apricot sorbetto and chickpea foam provide refreshing and savory elements to the cocktail. Finally, the drink is topped with a touch of espelette pepper and garnished with micro basil and a Fresno chili. Vesuvius was concocted by Carnevino’s own barman Adam Rains and sells for $16. It will be available through Aug. 31, 2016. Carnevino Italian Steakhouse at The Palazzo (“carne” indicating the highest quality steaks and “vino” for extraordinary wines) is Mario Batali and Joe Bastianich’s interpretation and celebration of the classic steakhouse presented in their signature Italian style. The finest beef, superior ingredients and world-renowned wine list make award-winning Carnevino the premiere destination for steak lovers. All of the steaks prepared by Executive Chef Nicole Brisson are dry-aged in Las Vegas then rubbed with sea salt, black pepper and fresh rosemary to achieve otherworldly tenderness and flavor. Furthermore, porterhouses and ribeyes are aged a minimum of 90 to 120 days, well beyond industry standards. Carnevino also offers organic veal, Colorado lamb, Heritage Foods pork, handmade pastas, classic antipasti and side dishes inspired by the street food of Naples. For more information, like on Facebook or follow on Twitter and Instagram (@Carnevino). Click here to download high-res photos. To make reservations, call (702) 789-4141 or go to OpenTable.com.